Milk & Bone are a testament to the power of friendship. Best friends and collaborators Camille Poliquin and Laurence Lafond-Beaulne were remarkably in sync during their FME performance, whether they were blending their voices together in unison so they sounded like one or issuing tight harmonies. 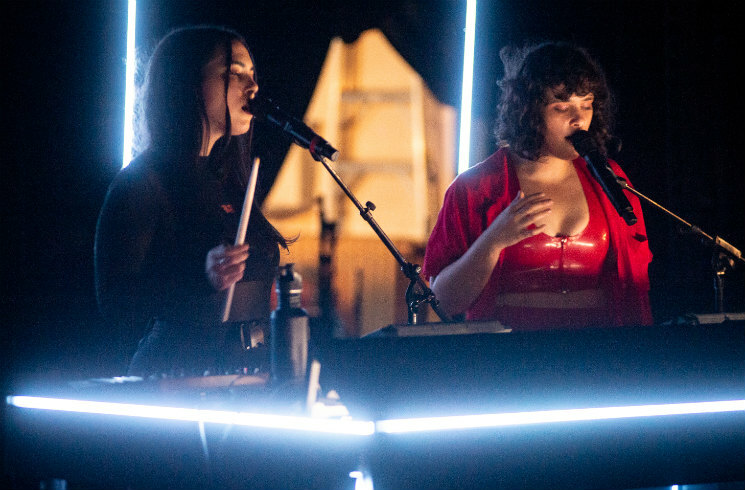 Their personal connection, with plenty of hugs and glances at each other, was reflected in their effortless coordination during the songs as they performed on a series of synths and drum pads behind a giant, two-person podium. The set's best moments came when the duo were able to leave their podium behind for brief moments to dance and sing at the front of the stage, made all the more endearing when they had to race back to their station to trigger the next sample. Moments like these during the tracks "KIDS" and "Faded" gave an indication of the pop star heights the duo could reasonably achieve. Both Poliquin and Lafond-Beaulne possess an infectious enthusiasm, and every moment it came through was a reason to celebrate.